That's just what I've been trying to do lately.. relax. I've got sooo much studying to do over the next few weeks. Board Exams and finals are looming in the not-so-distant future. You can't blame me for feeling stressed out. But! As the workload intensifies, so does my commitment to self care. I've been really, really good about eating loads of vegetables (I even made my first green smoothie! 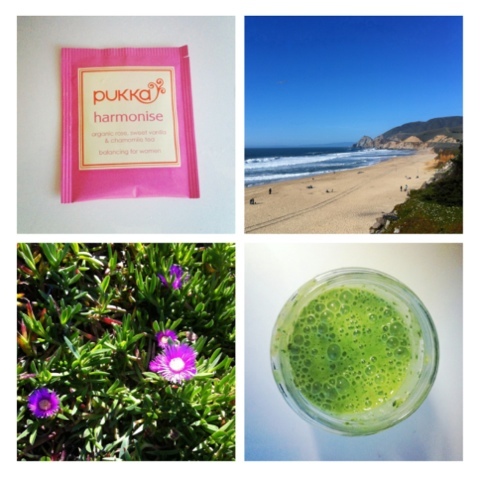 ), practicing yoga every night, and making Pukka tea (like this one - "Harmonise") to calm me down. Speaking of Pukka, this stuff is magic. I've tried a handful of their teas and so far "Relax" and "Three Ginger" are my favorites. I've even got the boyfriend drinking them, so you know they're good!